Attaining respect as a new band is always an uphill climb to prove yourselves – in the studio, on the stage, in every facet of being a group. Couple that as an all-female metal act, and you understand the uphill climb Swiss traditional metal quintet Burning Witches face. It’s always good though to have critical support out of the gate which these ladies did with their debut three song demo – as well as gaining attention from Destruction mainman Schmier to boost the profile of the band. Signing to Nuclear Blast for their second album Hexenhammer, you can feel the axe harmonies, soaring melodies, and pedal to the double bass floored throughout these tracks – inspiring a current generation of metalheads to raise fists and salute to the power of the genre. Reaching out to vocalist Seraina Telli and drummer Lala Frischknecht, we discuss the formative years and development of the band – the concept behind the new album and special artwork, plus thoughts on Judas Priest, Dio, and Doro among others, as well as the challenges of a newer band in the scene. 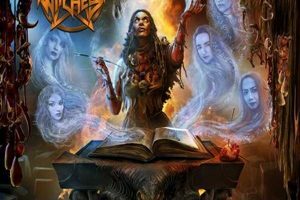 Dead Rhetoric: Burning Witches started in 2015 – what can you tell us about the initial development of the group? Was it easy to find the right members and did know straight away the style of heavy/power metal you wanted to develop, or was this a feeling out process? Seraina Telli: It was not that easy to find the girls to play in this band- but some of us know each other for many years. Others like Lala we found through the internet. Dead Rhetoric: Your initial three song demo received accolades in major German press magazines like Metal Hammer and Rock Hard, as well as musician support from Schmier of Destruction. Did this type of reception surprise you out of the gate – and set up future expectations for a promising career as a band? Lala Frischknecht: After the release, we didn’t expect that it would be featured in the magazines because as a (new) band, we didn’t know what our future holds. It’s a good introduction for us, it’s not that easy but somehow they noticed our talent and potential. That’s why they put it there. Schmier is always helping us with the band, he has a lot of metal knowledge regarding the music and he has good connections for us. We also have friends in the Swiss band Gonoreas, and we have a good family supporting us here. We are very fortunate to have all of this support. Dead Rhetoric: Hexenhammer is the second Burning Witches album – and debut for Nuclear Blast. Where do you see the major differences in the execution, songwriting, and recording sessions for this effort compared to last year’s self-titled effort? Seraina: Of course for us we know each other better than the first album, so we are more used to working together. We have a better feeling together as a band- you can hear it in the songwriting. That’s the biggest difference. Lala: Hexenhammer compared to our first album, has better song arrangements, good production quality, and more heavy metal. Our first album is also great. It’s hard to compare these two. 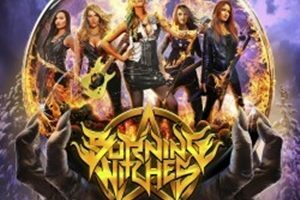 In this new album, the spirit of Burning Witches is still there, the harmonious guitar riffs, powerful vocals, and really fast drumming. Dead Rhetoric: Can you tell us a little bit about the concept for this record – it’s based on something relating to your own Swiss history? Seraina: Yes, it’s not only a Swiss thing but German and Austria too with this Hexenhammer book. It’s quite interesting for us. Lala: Having a name like Burning Witches, we thought that Hexenhammer would be a good concept for the album because it deals with our history. Living in Europe, and that book deals with witch hunting which is quite a sad story in the dark days of our history. It makes sense for us to use this concept rather than using something that is completely different or doesn’t fit for our name. Dead Rhetoric: You’ve covered bands like Judas Priest and now Dio on your records with “Jawbreaker” and “Holy Diver”. Tell us the relationship these classic bands have had to shape your views of heavy metal personally and fond memories you have surrounding their discography or live performances? Lala: It’s very clear that our influences come through bands like Iron Maiden and Judas Priest. It helps us to grow as musicians and metalheads, since we listened to those bands for quite a long time. It shapes us not only musically, but to be better as people. We have been playing “Holy Diver” during live shows, and people liked it so that’s why we ended up putting it on the album. This is a very beautiful song from a very beautiful band. Dead Rhetoric: Where do you see the differences in guitar playing and personalities with Sonia Nusselder in comparison to Alea Wyss? Seraina: That’s not an easy question. They are totally different people, but both have their talents. It was sad that Alea left the band, but with Sonia she’s doing a great job and we are looking forward to her doing more concerts and getting to know her better. Dead Rhetoric: Can you tell us a little bit about the cover art and how the design process came about – is it a collaborative effort between the band and artist, or do you give that person the freedom to develop ideas based on the music and feelings it promotes? Seraina: For the cover of the album we had the great amazing artist Gyula Havancsák from Hungary. We were working together with him, we had our ideas that the book should be on the cover and that we are coming out of the book as ghosts of the witches. Lala: Since our album concept is about Hexenhammer, we thought about as the lady opens the book the souls of the witches come alive. It has all the elements that turn into this amazing art piece. The album cover totally speaks for itself, once you open it to listen to it, your appetite will get into it! Dead Rhetoric: How would you describe Burning Witches live compared to your studio performances? What do you hope to get across to the audiences? Seraina: For us, it’s important to play the songs like you hear them from the studio. We don’t use any backing tracks, it’s a really old school sound. We want to have fun with the crowd. Dead Rhetoric: What are some of the challenges that Burning Witches faces at this early stage of your career that you hope to be able to stabilize or overcome? Lala: As an all-female band, it’s not that easy to be in this metal world. It’s a male-dominated scene. There are good points and bad points to being in an all-female band. For instance, some people consider it as rare and it’s easy for them to have doubt because of your gender. The second one, it’s also good because of the rarity- they find it to be very interesting for curiosity reasons. At this point, we are reaching more people that don’t really care about the gender issue, and we are so grateful for these people that in spite of being an all-female band, they will still love us because it will be all about the music! (laughs). Dead Rhetoric: Do you look to someone like Doro Pesch as inspiration because of the many decades she has been delivering metal to the scene? Seraina: Doro Pesch is a really great metal icon, and we really like her very much. We just want to do our own music, and we don’t want to have as many influences from other bands. Lala: It doesn’t matter to us if you are in a male band or a female band, it’s all about the music. Speaking of Doro, we are quite lucky that she is still fighting for metal music. She is a metal queen, and we are thankful for her. Dead Rhetoric: As a newer band, have you embraced the current promotional model of social media and instant technology to spread the message of Burning Witches worldwide – and do you believe consistent engagement and added content for your fans helps solidify your presence in the scene? Lala: If you compare the eras of the 1980’s to this modern era, back in the day you only had fanzines and metal magazines for the underground. In our time now, we have everything that we could ever want. The internet, website, webzines, magazines- you have everything. I think the bands now are quite lucky, they have a chance to have more exposure because of these social media websites and everything. Dead Rhetoric: How do you feel about your own metal scene in Switzerland – do you feel like you have proper support from the clubs, promoters, fans, other bands- or do you think you have better support in outside countries? Seraina: In Switzerland we have many metal bands, it’s just not a commercial scene. We don’t have many radio stations that will play metal or rock music. We have a big underground scene, and many bands that we try to support each other. It’s great to play here, we can do little concerts. Lala: Even if we are a small country, we are keeping the metal alive. Dead Rhetoric: We see many of the veteran bands of the scene slowing down and retiring. Where do you see the state of heavy metal worldwide, and do you believe there will be enough support from audiences to elevate some of these younger bands to position of future headline status for festivals like Sweden Rock, Hellfest, and Wacken as examples? Lala: If the people will continue to listen and support the music, the metal industry will still be there. There will be many followers still going to the concerts. It’s so important to support the scene, this is our environment and our life, so we better keep on going even if bands are struggling. As long as people go to the concerts, it doesn’t matter- even with five people, they will spread the word to get more followers. Seraina: When we have free time, we like to support other bands and always try to go to their concerts. That’s really important to do that. Dead Rhetoric: What types of hobbies or activities do you enjoy when you get a break away from the music? Seraina: We are very good friends, we have drinks together after band sessions, and we love to go shopping together. We like to make some jokes, have barbeques, and we are like a big family. Dead Rhetoric: How do you see the next twelve months for Burning Witches as far as touring and promotional opportunities taking place? Seraina: The United States, we really want to go someday to play there. We hope to get the chance soon. But first, we will be on tour in Europe next year with Grave Digger, and then we will see what is coming next. Lala: When the promoters are able to take us there, it will be a good experience for us. We are still in the learning process as a newer band, and we have many things to learn. We are really enjoying the fun.